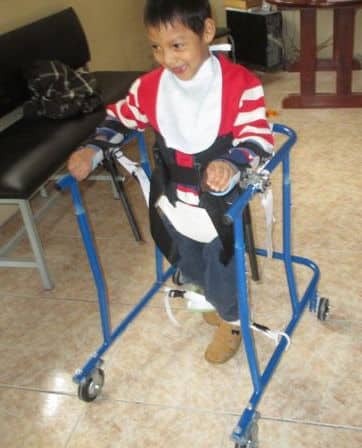 Promovilidad is an artesanal micro-enterprise in Quito that fabricates custom adaptive solutions for people with disabilities to participate in community, school, sports and home activities. Working in metal, wood, and plastics, Promovilidad designs devices according to preferences and needs of the client. Their Kinde-Pro gait trainer mobility device was designed in collaboration with Prótesis Imababura and is described below. The project to design gait trainers had been supported by a Rotary International Global Grant. The grant allowed for the purchase of materials and equipment and for consultation from international experts in engineering and rehabilitation. All children regardless of level of disability deserve the opportunity to get up and move around, to participate, to stand at the level of their peers, to develop their motor skills, and to experience moving under their own power. A gait trainer is a device that allows the majority of children with significant disabilities to get upright and walking. It consists of a sturdy frame, castors, and various add-ons to provide the amount of support needed by the child. Widely used in the United States, the cost there is between $1000-$2000. 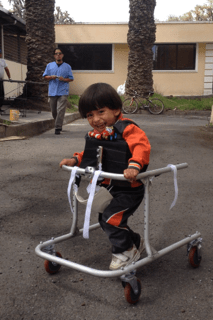 Gait trainers can now be fabricated for about $350- $450 in Ecuador. 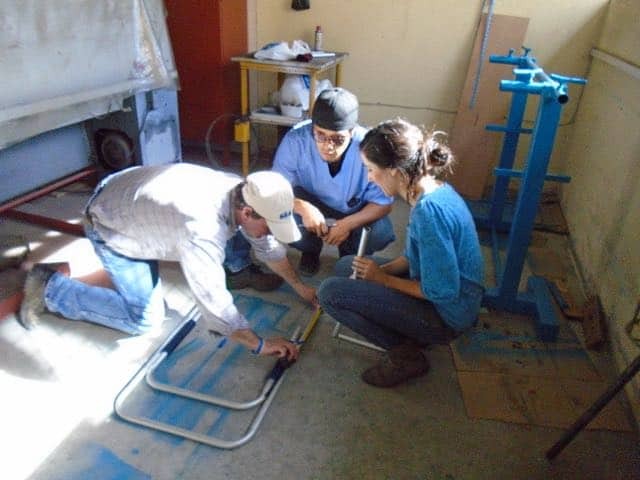 Our development team consisted of all volunteers: Paulina Villacreces and Roberto Ulluari, along with the assistance of Rick Nelson, Engineer, Sara Kearns, Engineer, Lumbani Munthali, Engineer, and Kit Frank OTR. After nine months of designing and testing, a successful gait trainer in 3 sizes that meets ISO standards for strength and stability was ready to be market-tested. At this point, Paulina and Roberto began a micro-enterprise Pro-Movilidad, with the objective of bringing this product to the children who need it at a reasonable cost. Pro-Movilidad is a sister organization to Prótesis Imbabura: both enterprises meeting an important rehabilitation need, staffed by Ecuadorian entrepreneurs, dedicated to providing a high quality device at an affordable cost.